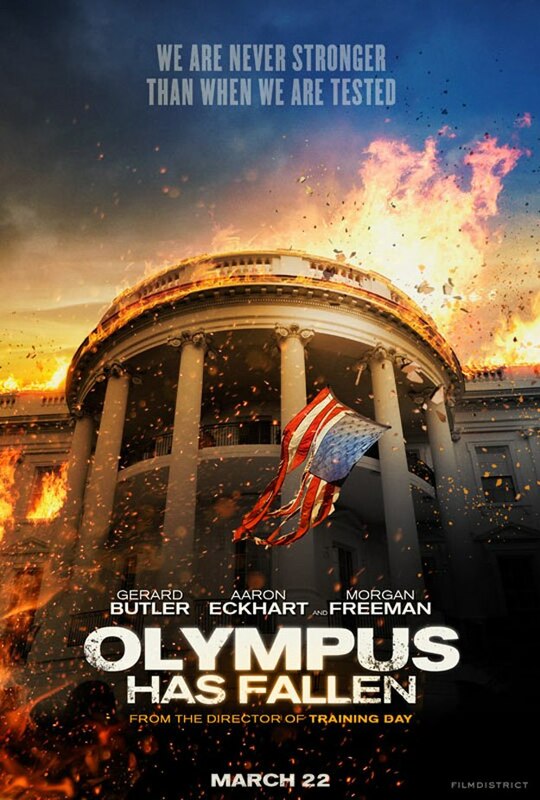 Olympus Has Fallen stars Gerard Butler, Aaron Eckhart, Angela Bassett, and Morgan Freeman in an action packed thriller that has an invading force looking to take down the most protected building in the world. 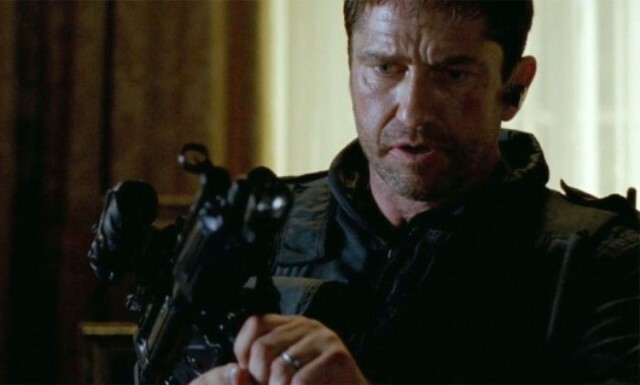 Director Antoine Fuqua has a diverse resume that includes movies like Training Day, King Arthur, and Brooklyn's Finest, although this might be his most ambitious effort yet. For months, President Benjamin Asher (Eckhart) has been mourning the loss of his wife who died in an automobile accident, his former head of security and friend Mike Banning (Butler) has been trying to deal with the fatal decision he had to make on that tragic day. Just as things are getting back to a sense of routine in the President and his son's daily lives, a new enemy emerges with designs on capturing the White House in an attempt to gain control of valuable U.S. military assets. With the attackers executing a precision plan, the security team quickly falls and military reinforcements are held at bay when it is revealed that the president and his top aides have are all being held hostage inside an underground control room. 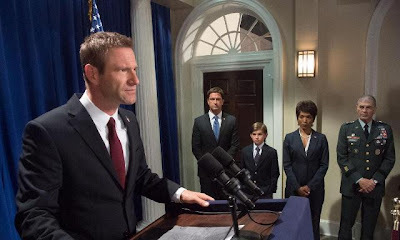 During the initial attack, Banning was able to get inside the White House and, after systematically taking out all ground floor opposition, sets his sights on rescuing his long time friend and the son who's secret information may be the key to the whole operation. Even with a star studded cast and capable director, this type of movie can easily fall into a comedy of movie cliché's and horrible action sequences. Fortunately for everyone involved, this movie avoids falling into those traps although it does toe the line all the way through. 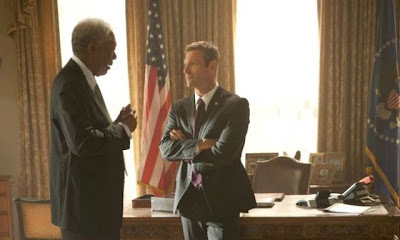 For someone who directed Denzel Washington to an Academy Award for his role in Training Day, Fuqua fails to get much more than passable performances from his cast this time around. 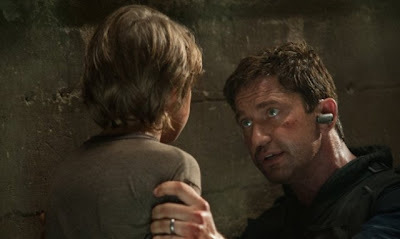 What is apparent is that Gerard Butler should focus on becoming more of an action star than trying to do the romantic comedies that have continued to disappoint. 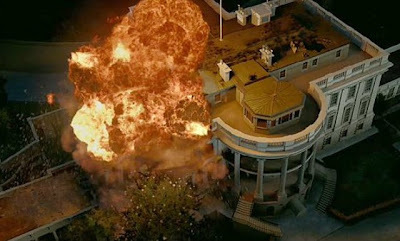 Based on the quality of the action in this movie and especially the attack on the white house, one has to think there were some serious budget limitations for the effects department. There were so many really bad CGI shots that aerial footage and wide shots of the White House lawn battle looked more like video game cut scene footage instead of a large scale motion picture. This would have ruined the movie completely if it had held true all the way through, but after that attack was finished, the rest of the picture actually turned into a pretty cool action thriller. The other thing I noticed was a non stop stream of similarities to the original Die Hard movie (terrorists with hidden agenda, computer whiz taking control of the building, attempted rooftop attack by helicopter, good guy arguing with bad guy over radios) to the point where I was certain Butler's character would have to run barefoot through a bunch of broken glass at some point. This doesn't take away much from the movie, it just shows a lack of effort in the creative process. That being said, Olympus has Fallen actually turned out to be pretty good considering my low expectations going in. If you can get past a fair amount of cheese and some really bad special effects, you will be left with a pretty intense movie as long as you stay focused on Butler and his daring rescue mission. If it helps, you could just say its a brand new Die Hard movie and, if that's the case, its actually quite a bit better than the Die Hard movie that came out last month.